Mercedes Benz boys and girls can cruise the block in style in their new Mercedes SLR ride on car for kids while supplies last. New and improved with bluetooth remote control! Now parents can press the "STOP" button on the remote control which stops the car from driving. The speed level is now ON the remote itself, so parents control the speed at will. Plenty of power thanks to the upgraded twin 12 volt motors. Choose from black or white. Very fun with very cool working front and rear lights. Yes, it comes with a seat belt. Do not be fooled by imitators, only official Magic Cars® sold on TrendTimes.com come with the Best In Class 1 year bumper to bumper warranty for free! Turn the key to switch on your Mercedes SLR and it will "vroom" to life. Drive forward, backwards, left, and right via the steering wheel. But we kicked it up a notch as this is a remote control (RC) Mercedes ride on car. Meaning, we give you a remote control so you can drive the car around with or without your kids in it. Flick a switch, and you can give "ride in control" back to the child. Watch the official TrendTimes Magic Cars® RC ride on car commercials and enjoy what is so amazing. Mercedes SLR ride on car measures almost 4 feet long, 2 feet wide, and can hold up to 60 pounds. This ride on car is best for ages 1-6. Reach speeds of 3-4 mph. Little red Corvettes have nothing on this amazing Mercedes ride on car in red. This great battery powered ride on car costs about 1/10th the price of a tire for a full size Mercedes SLR. The remote control Mercedes SLR ride on car plays music, has MP3 hookup port, and has a horn too. If you own a full size Mercedes SLR and are reading this right now and have kids. Buy one or more of these today and you will have a lot of fun as we will send separate operating frequencies for the remote controls so you can race. If you are like the rest of us and do not own a Mercedes SLR, do not feel bad. Never say never, plus at least your kids can drive around in a Mercedes Benz thanks to you! You can always say to them, "Hey kid, I bought you a red Mercedes, remember? Now eat your peas." Will buy another. This car is amazing my niece she loves it. This car was the wow factor. !!!!!! Bought this Mercedes SLR kid car 11 months ago for my little nephew. No complaint yet. He loves honking the car horn all the time and I love to see him dance to the music in a peculiar style while I keep control of the drive using its fully-functional remote control. The delivery was quick and packing quite impressive! The remote control feature lets me play with my kid without exhausting myself running here and there. I can sit on the patio or simply stroll while controlling his rides speed at will. Plus we get to spend time together. Thanks for such a parent-friendly product. 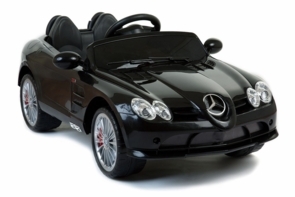 Set yourself apart from the rest with a new Mercedes 600 Class ride on car for children with remote control. Holds up to 105 pounds and comes with rechargeable battery pack and charger. Perhaps you drive or dream of a full size Bentley, but this car is perfect for children and everyday.